Over the past few years, I’ve made the contention that there are two job markets - one that’s public for all to see, and the other hidden. The hidden job market is created when a hiring manager thinks about filling a job. If the job can’t be filled internally or through a referral, it then goes public. There are significant advantages to filling jobs in the hidden market due to more flexibility in how the jobs are structured and compensated. When jobs go public, they’re overdosed with an endless checklist of requisite skills, salary ranges, experience requirements, educational needs, competencies and personality traits. In a recent LinkedIn Influencer post I introduced the public vs. hidden job market as a means to highlight the differences between how active and passive job seekers are sourced and hired. This comparison is shown in the graphic. 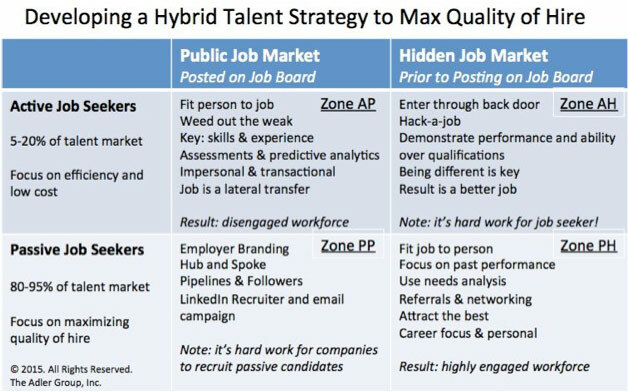 Most companies seek out active job seekers in the public market using a weed out the weak process – shown as Zone AP. Here candidates are force-fitted into jobs that are, at best, lateral transfers. I contend this is the root cause of why employee disengagement is a whooping 68%! Active job seekers who want better jobs or who don’t meet the traditional requirements need to hack-a-job in the hidden market as shown by Zone AH. Here they have a chance to demonstrate their ingenuity and performance rather then justify why they don’t meet a “perfect” set of arbitrary requirements. Passive job seekers represent the bulk of the talent market. To hire them they first need to be recruited and then offered positions that provide job stretch and upside opportunity. The best approach is represented by Zone PH. When done properly, the result is a more engaged, high performing workforce. Unfortunately, most companies struggle with hiring passive candidates by using the appropriate high-tech processes to source them, but not enough high-touch to recruit and hire them. This is represented by Zone PP. Emphasize an attract-the-best approach, versus a weed-out-the-week approach to recruitment advertising. Eventually all job candidates will review the public job posting to learn more about the job. When the job emphasizes the learning, doing and becoming rather than the skills required, you’ll attract more of those looking for career moves and less of those who will accept a lateral transfer. 2. Implement a hub-and-spoke sourcing model. By clustering similar jobs onto a microsite, candidates can have the most suitable jobs presented to them rather than requiring them to hunt and peck for one that best matches their skills. The top level of the microsite needs to describe the range of jobs available and how they relate to important company initiatives. This will induce more passive and less active candidates to “browse.” These people can then be converted into more engaged followers. Job branding involves incorporating the intrinsic motivators the best people use when evaluating new job opportunities. This needs to be the basis of any type of recruitment advertising copy, whether it’s a posting, voice mail or email. 4. Track passive candidate yield from sourcing to recruiting to hiring. Getting 100 strong people interested in your opening is a waste of time if only a few are hired. By tracking these six metrics, you’ll be able to identify the gaps in your recruiting processes that need to be closed. 5. 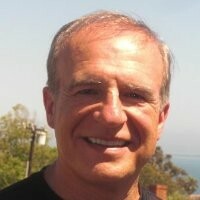 Use needs analysis to qualify candidates, not box checking. Needs analysis involves comparing a candidate’s abilities and aspirations in his or her current situation to what your job offers. If big enough, the difference represents the career opportunity. It’s better to modify the job to increase the stretch and growth, rather than the compensation. This whole process is called recruiting. 6. Use a performance-based approach for assessing candidates. To ensure all candidates are assessed properly based on their ability and motivation to do the work, we suggest giving them this PowerPoint template as a means to have them formally document and present their qualifications. By giving them the questions ahead of time and having hiring managers review their answers, assessment accuracy is increased. This type of Performance-based Interviewing approach is essential with passive candidates, since the recruiting piece is embedded in the questioning. Recruiting and hiring the best active and passive candidates requires a hybrid high-touch, high-tech process. By attracting the best and modifying the positions to meet their needs, it’s possible to focus on what really matters to them: the long-term career opportunity. Collectively, this is how a company not only raises the talent level of every person hired, but also maximizes employee engagement, performance and job satisfaction.